Monster Hunter 4 hits Japanese store shelves on September 15th, but just in case there wasn't enough hype surrounding its launch already, Nintendo is holding a special Monster Hunter-themed Nintendo Direct on September 8th. The video will go live at 8PM JST, 1PM CEST and 7AM EDT. It's going to be in Japanese obviously, but it could be worth watching as it may contain fresh information — information relating to the mysterious collaboration which both Nintendo and Capcom have been hinting at recently. 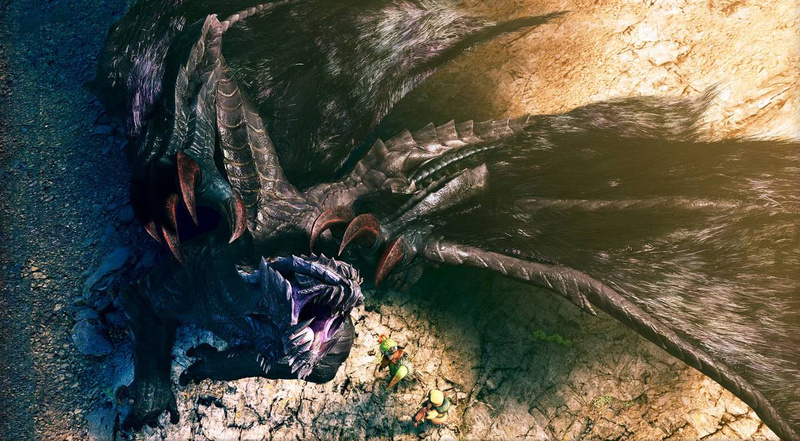 Monster Hunter 4 doesn't have a western release date as yet. T_T Please bring MH4G over when it gets made! I am a big fan of Monster Hunter's games when they have the option for G rank. It just adds so much more depth and fun to the game due to the crazy and slightly overpowered monsters and gear setups! Unfortunatley I won't be able to watch this, it is way too early in the morning here. Midday on Sunday UK time? Duly noted. Stoked to watch this one. Would love to hear of a Wii U HD version in this Direct. Man I'm crossing my fingers hoping for a US release. Have been a huge fan of the series and bought my Wii U just for it. Seems like Nintendo has its hands in the cookie jar as I have not heard any news other than Frontier on a Sony console. So hopefully there is light at the end of the tunnel and we see it localized every where else. Still playing the crap out of Monster Hunter Tri Ultimate as we await a Western Release date for this game. Won't be at home to watch that... maybe I could on my phone, but 3G is poor in my area. Ah well, it'll be nice to see some of the game. I know it won't happen, but it'd be nice if they randomly threw a "Monster Hunter 4 NA/UK Direct"
MH4 Sept 15 and X + Y Oct 12. Monster Hunter 4 in the states for Christmas please!!!! Just release it soon so my friend doesn´t have to play online trough my WiiU. How many 3DS owners actually use that option? Why would they announce a western date in a Japan only direct? Mh3 is so stinking good. @rjejr Pachter will just say that Nintendo made the changes that he advised them to do, which is why it is now succeeding. He's like a politician. Please don't keep repeating the release date. Save it for the end of the broadcast. Awesome. I will probably watch, even if I don't understand. I'm very excited for MH4 — I still play MH3 very actively. Talking to one of my friends who is living in Japan right now, about possibly sending me the MH4 3DS LL bundle (If we can get it cheaper than me importing it). Couple of things, 1: This is freaking awesome, definitely am going to pick it up on Wii U.
Mario and Luigi cat costumes 8D watching it hear http://www.nintendo.co.jp/nintendo_direct/20130908/index.html LINK! ?